Cystic, edematous, and myxoid lesions of the umbilical cord are rare conditions which have been sporadically reported in literature, most often detected at prenatal ultrasonography. Most reports of cystic cord conditions are ultrasonographic studies with a few featuring pathological descriptions. This is a report of a rare case of umbilical pseudocystic lesion with full pathological description. The possibility of this extremely myxoid lesion confounding the diagnosis of tumors such as angiomyxoma is highlighted. The umbilical cord is an all-important lifeline connecting the fetus to the placenta and through which the fetus derives nourishment. A variety of abnormal cord conditions such as abnormal coiling, stricture, abnormal length, true knots, entanglements, prolapse, and velamentous insertion are known risk factors for fetal neurological injury, intrauterine growth retardation, and intrauterine fetal death., Cystic lesions of the umbilical cord are rare conditions which have been sporadically reported in literature, most often detected at prenatal ultrasonography. Most journal reports of cystic cord conditions are ultrasonographic studies with only a few featuring pathological descriptions. We report, with full pathological description, a rare case of umbilical cord cyst, discovered at prenatal ultrasonography and followed till delivery, in a 30-year-old woman. This, to the best of our knowledge, is the first reported case of umbilical cord myxoid pseudocyst from Sub-Saharan Africa. The mother, a 30-year-old G2P1 woman, had no significant medical or obstetric history. A prenatal ultrasonographic scan at 24-week gestational age (GA) revealed a singleton normal fetus with multiple anechoic umbilical cord lesions measuring 5.4 cm × 5.0 cm, 4.6 cm × 4.0 cm, and 3.6 cm × 2.9 cm. Color Doppler imaging confirmed normal flow through the umbilical vessels. Subsequent repeat scans at 29-week and 35-week GA established a progressive increase in the size of the cord lesions as well as good fetal physical condition. At 35 weeks, the conglomeration of cord lesion measured 11.5 cm × 9.67 cm × 7.2 cm and the largest cyst measured 7.0 cm × 5.12 cm. On account of the cord lesion, she underwent an elective cesarean section at 37-week GA and was delivered of a male baby with Apgar score of 10 at 1 min and 5 min. The baby had no physical deformities or abnormal facies and has remained normal 9 months postnatal. Pathologic examination of the cord and placenta: Grossly, the umbilical cord measured 56 cm in length and was inserted paracentrally. The placental end of the cord was normal up to a length of 3 cm. The rest of the cord was edematous and enlarged with cystic area which ruptured during operative procedure. The average diameter of the cord was 4.5 cm (standard diameter of a cord ranges from 1.25 to 2.00 cm) [Figure 1]. Cut section of the enlarged portion exuded copious mucoid, slimy substance. Three vessels were identified within the cross-section of the cord. The placenta was discoid in shape with unremarkable maternal and fetal surfaces [Figure 1]. The placenta weighed 540 g and measured 19 cm × 10 cm × 2.5 cm when trimmed of the membranes and cord. Cut surfaces showed beefy-red parenchyma with no gross abnormalities. The membranes were of normal color and transparency and were inserted at the margins. Histologic sections of the umbilical cord showed extensive myxomatous degeneration of substance of the cord with formation of pseudocysts containing mucoid fluid [Figure 2] and [Figure 3]. The vessels of the cord (two arteries and one vein) were normal. Histologic sections of the placenta and the membranes were unremarkable. Focal areas of placental parenchymal calcifications in keeping with normal placental aging were present. Ours is a case of giant umbilical cord cystic lesion which came to attention at 24-week prenatal ultrasound scan. Pathologic study revealed degeneration and pseudocysts of the Wharton's jelly. The baby was physically normal, and the cause of the cord lesion was not found. Umbilical cystic lesions are detected at prenatal ultrasonography and have been the subject of a number of different of reports. These reports have varied in scope and focus and could broadly be categorized into case reports or small case series of cystic lesions seen at birth or detected earlier in pregnancy and followed to delivery;,,,,,,,,, retrospective reviews of sonographically detected umbilical cord cyst and assessment of pregnancy outcome;,, ultrasonographic screening of large numbers of pregnant women for umbilical cystic lesion;,, and matched cohort study comparing pregnancy outcomes in women with first trimester umbilical cord cyst and those without. Studies show that the prevalence of umbilical cyst at prenatal ultrasonography ranges from 0.4 to 3.4%.,, Cysts which resolve spontaneously within the first trimester are not associated with adverse pregnancy outcome., Persistent second- and third-trimester umbilical cord cysts are associated with varying rates of chromosomal anomalies and/or fetal structural defects.,, In our case, the cyst was discovered at 24 weeks and persisted through pregnancy. We could not get a karyotype due to lack of facilities, but the baby, a male infant, had no features of congenital malformations at birth and has remained healthy 9 months postnatal. Umbilical cord cysts have been categorized into epithelial-lined true cysts, which arise from remnant of allantois or omphalomesenteric duct, and pseudocysts which result from edema and degeneration of Wharton's jelly. The implication of this is that lesions with similar gross or sonographic cystic appearance may be pathologically different and may have diverse etiologies. In fact, umbilical cord cysts have been associated with various pathologic entities such as angiomyxoma, patent urachus, and abnormality of cord vessels.,,,,,, A thorough pathologic study and classification of umbilical cord cysts is warranted as it is possible that different etiologic types may correlate differently with pregnancy outcome or fetal condition. Unfortunately, but quite understandably, the methodology of many ultrasonographic studies of umbilical cord cysts does not include pathological examination. The abundant myxoid appearance of the lesion we saw was most probably caused by degeneration and liquefaction of Wharton's jelly which is biochemically composed of the mucopolysaccharides chondroitin sulfate and hyaluronic acid. 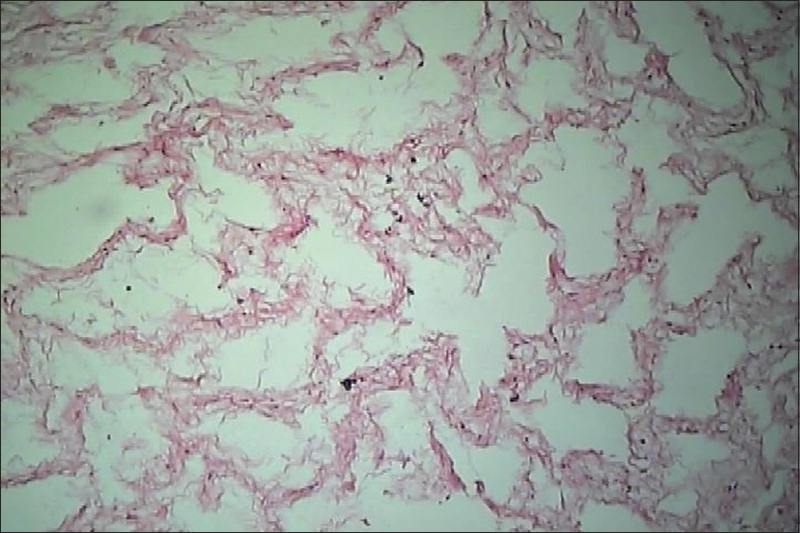 There was no angiomatous component or stromal proliferation to warrant the diagnosis of angiomyxoma or myxoma. Important to note here is the fact that degeneration and edema of Wharton's jelly could give rise to remarkably myxoid cord which could potentially lead to misclassification of a hemangioma of the cord as an angiomyxoma. Umbilical cord cystic and edematous lesion is a very rare condition which can sometimes occur with no obvious associated fetal or maternal abnormality. The authors wish to acknowledge the assistance given by Mr. Ozioko Frank Ekene (BSc, MSc) in literature search and retrieval. Baergen RN. Cord abnormalities, structural lesions, and cord “accidents”. Semin Diagn Pathol 2007;24:23-32. Kraus D, Gersell F. Diseases of the placenta. In: Kurman RJ, Elleson HL, Ronnet BM, editors. Blaustein's Pathology of the Female Genital Tract. 6th ed. New York: Springer; 2011. p. 1000-69. Silver RK, Dooley SL, Tamura RK, Depp R. Umbilical cord size and amniotic fluid volume in prolonged pregnancy. Am J Obstet Gynecol 1987;157:716-20. Yavner DL, Redline RW. 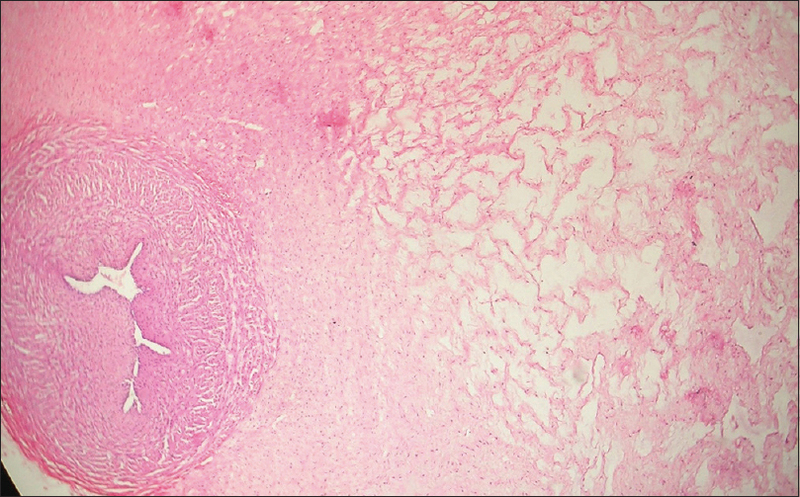 Angiomyxoma of the umbilical cord with massive cystic degeneration of Wharton's jelly. Arch Pathol Lab Med 1989;113:935-7. Smith GN, Walker M, Johnston S, Ash K. The sonographic finding of persistent umbilical cord cystic masses is associated with lethal aneuploidy and/or congenital anomalies. Prenat Diagn 1996;16:1141-7. Tennstedt C, Chaoui R, Bollmann R, Dietel M. Angiomyxoma of the umbilical cord in one twin with cystic degeneration of Wharton's jelly. A case report. Pathol Res Pract 1998;194:55-8. Sepulveda W, Leible S, Ulloa A, Ivankovic M, Schnapp C. Clinical significance of first trimester umbilical cord cysts. J Ultrasound Med 1999;18:95-9. Schiesser M, Lapaire O, Holzgreve W, Tercanli S. Umbilical cord edema associated with patent urachus. Ultrasound Obstet Gynecol 2003;22:646-7. Kiran H, Kiran G, Kanber Y. Pseudocyst of the umbilical cord with mucoid degeneration of wharton's jelly. Eur J Obstet Gynecol Reprod Biol 2003;111:91-3. Kilicdag EB, Kilicdag H, Bagis T, Tarim E, Yanik F. Large pseudocyst of the umbilical cord associated with patent urachus. J Obstet Gynaecol Res 2004;30:444-7. Kita M, Kikuchi A, Miyashita S, Yoshizawa K, Takagi K, Ogiso Y. Umbilical cord cysts of allantoic and omphalomesenteric remnants with progressive umbilical cord edema: A case report. Fetal Diagn Ther 2009;25:250-4. Haino K, Serikawa T, Itsukaichi M, Numata M, Kikuchi A, Kojima K, et al. Large pseudocyst of the umbilical cord detected in the second trimester. J Med Ultrason (2001) 2010;37:213-5. Whipple NS, Bennett EE, Kaza E, O'Connor M. Umbilical cord pseudocyst in a newborn. J Pediatr 2016;177:333. Shipp TD, Bromley B, Benacerraf BR. Sonographically detected abnormalities of the umbilical cord. Int J Gynaecol Obstet 1995;48:179-85. Sepulveda W, Gutierrez J, Sanchez J, Be C, Schnapp C. Pseudocyst of the umbilical cord: Prenatal sonographic appearance and clinical significance. Obstet Gynecol 1999;93:377-81. Zangen R, Boldes R, Yaffe H, Schwed P, Weiner Z. Umbilical cord cysts in the second and third trimesters: Significance and prenatal approach. Ultrasound Obstet Gynecol 2010;36:296-301. Ross JA, Jurkovic D, Zosmer N, Jauniaux E, Hacket E, Nicolaides KH. Umbilical cord cysts in early pregnancy. Obstet Gynecol 1997;89:442-5. Ghezzi F, Raio L, Di Naro E, Franchi M, Cromi A, Dürig P. Single and multiple umbilical cord cysts in early gestation: Two different entities. Ultrasound Obstet Gynecol 2003;21:215-9. Skibo LK, Lyons EA, Levi CS. First-trimester umbilical cord cysts. Radiology 1992;182:719-22. Hannaford K, Reeves S, Wegner E. Umbilical cord cysts in the first trimester: Are they associated with pregnancy complications? J Ultrasound Med 2013;32:801-6. Brooks K, Guileyardo J, Le D, Joykutty J. 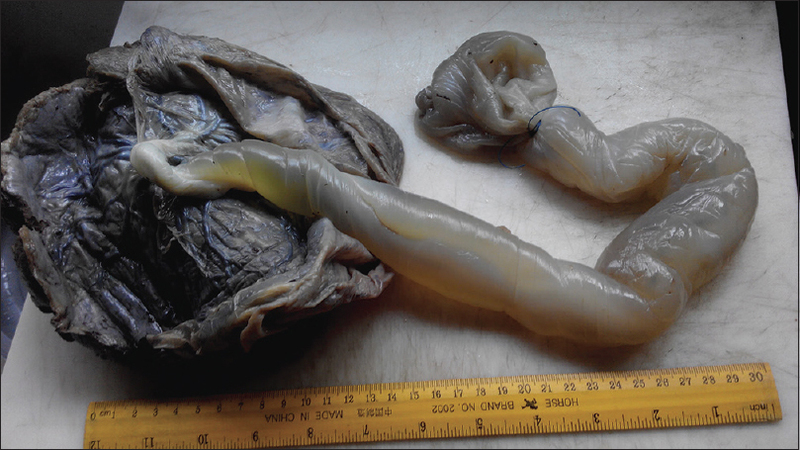 Giant cystic umbilical cord associated with patent urachus and intrauterine fetal demise. Proc (Bayl Univ Med Cent) 2017;30:209-10.